NOTE: If you aren’t worried about accumulating points and just want credit for attendance, you can run the 5K. To be scored, you need to run the 10K. IMPORTANT: You can sign up for our free bi-weekly newsletter, NER Express, crucial to staying up to date with Pub Series news, Right Here!. Don’t be one of those people who emails us at the end of the Series asking why we didn’t email you for a jacket size before the deadline: No. 1, we don’t have your email; No. 2, the info was in the e-newsletter. 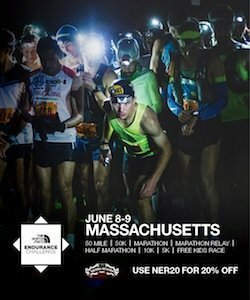 Beginning in 2011, Boston-based athletic sportswear giant New Balance signed on as the the multi-year sponsor of the NER Pub Series, and we’re damn glad to have them!Gender specific New Balance Pub Series jackets will be awarded to everyone who runs six of six races. For those who complete five of six races there’s a pair of New Balance running shoes in the offing. End of Series swag: Along with a new pair of New Balance running shoes to the top 5 Open men & women, as well as age-group overall winners, the end of series cash payouts for the top five men & women this year are: 1st, $200 – 2nd, $150 – 3rd, $125 – 4th, $100 – 5th, $75. Divisional winners from Masters through 70+ also win a new pair of New Balance running shoes and $50, with merchandise going to places 2-3. Jacket Info: Your lifeline to the Pub Series is our website NER and free bi-weekly enewsletter as well as the mag. Take advantage of all because that’s where the notice asking for your jacket size will appear after the fifth race in the Series. If the deadline is missed (and sorry, but this is your fault, not ours) men’s sizes default to ‘large’ and women to ‘medium.’ No whining allowed. Important notice on Jackets: After spending over $1,000 to mail out jackets (over the years) following Awards Night, No mas! If you can’t attend Awards Night at Doyle’s, and you can’t arrange for a friend who is attending to pick up your jacket, you can pick it up at NER World HQ, 320 Washington St. Norwell, MA (2nd floor) or show up at the following April’s Pub Series race at Doyle’s si vous plait. The top overall 50 places for men and women are based on cross country scoring. Win the race, you get 50 points, come in 50th, you get one point. Everyone of any age is eligible to score here. Age group scoring goes 10 deep for Masters & Seniors (50-59), 8 deep for Vets (60-69) and 5 deep for 70+. Example: If you’re the top 40-49 runner in a race, you get 10 points in your age division. If you’re 10th Master, you get one point. Implemented in 2014: The Octogenarian (80+) division, 3-deep for men. Much welcomed in 2013 was retail vendor Marathon Sports. If you manage to complete five of six Pub Series races and earn a pair of New Balance shoes, you can take your certificate to any of 14 (& counting) Marathon Sports stores and pick out your shoes the same day. This beats (by far) having to send a certificate with your shoe size to a warehouse and waiting for delivery.